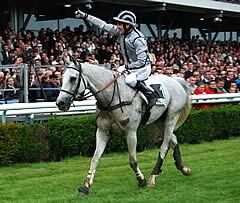 Chriseti, trained by Etienne Leenders and ridden by Wilfrid Denuault, won the €112,000 Prix Anjou Loire Challenge for the second year running. Chriseti won by 15 lengths over Silver Whisper in 2nd and Phakos in 3rd. Six Irish & English horses travelled to Lion d'Angers for the race. Some of Britain and Ireland’s finest cross country horses will meet in the Prix Anjou-Loire Challenge (6.45pm local time) at Lion-d’Angers Racecourse in France on Thursday, May 17. The longest cross country race in the world, run over four miles, four and a half furlongs and worth 112,000 euros, is the fourth contest in the Crystal Cup European Cross Country Challenge for 2012. 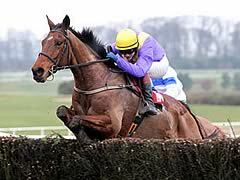 The French race has attracted six Irish and British runners including the winner of the La Touche Cup at the Punchestown Festival in April, the Willie Mullins-trained Uncle Junior, who is the mount of Emmet Mullins. The third that day, Saddlers Storm from Tony Martin’s yard, received 14lb and was beaten just over four lengths, but is taking on the winner again, this time off level weights, with Paul Carberry in the saddle again. Also lining up are the first four in the second leg of the Crystal Cup series at Fontainebleau, France, over three miles and six furlongs on April 4. Maljimar, trained by Nick Williams in Devon and ridden by James Reveley, beat Quezac De La Roche (Francois Cottin) by a length and a half, with Quetzal Bay (Christian Le Galliard) and L’Aubergiste (Jean Luc Guillochon) third and fourth respectively. Reveley partners Maljimar again. Ireland was successful in this race in 2010, thanks to Another Jewel, trained by Denis Murphy, and the 10-year-old, only seventh last year, lines up for a third time. Davy Russell, recently crowned champion jump jockey in Ireland, takes over the ride. A field of 17 is due to line up in the Prix Anjou-Loire Challenge, with last year’s winner Chriseti (Etienne Leenders) going for back-to-back victories. The Crystal Cup was a new initiative developed in 2010 to bring together the finest international horses and riders to reward the most successful stable in cross country steeple chasing. 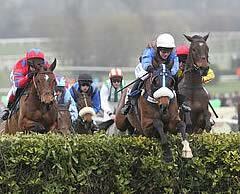 The 10-race series, with nearly 700,000 euros in prize money, is hosted by many of Europe’s premier racecourses, over unique combinations of hedges, banks, ditches and timber. This year’s Challenge began in Pau in South West France in February and the final race is at Cheltenham in December. The series consists of four further races in France and visits to Ireland, Belgium, Italy and to the Czech Republic for the Velka Pardubika. Nick Williams is currently the leading trainer of the series following a win with Maljimar at Fontainebleau and fifth at Punchestown with Shalimar Fromentro. Nick’s wife and assistant trainer Jane is currently the leading owner. Points are awarded to the first six horses to finish in each of the 10 races, with bonus points awarded to horses that have travelled from abroad to take part. To be eligible to win the series, competitors must participate in a minimum of three Crystal Cup races during the year, including at least two outside their country of training. The Crystal Cup series culminates at Cheltenham Racecourse where the leading trainer and owner of the series will be awarded the Crystal Cup and share €35,000 in prize money.